We’d love your help. Let us know what’s wrong with this preview of On the Precipice by Chris Hambleton. Is the Spirit of America dying? Many have grown increasingly aware of this possibility since the Great Recession began, but few want to admit it. Today, America is deeply divided and filled with uncertainty, and a palpable sense of malaise has settled over her people. Could it really be that America’s best days are behind her? We Americans used to be proud of our nation, an Is the Spirit of America dying? Many have grown increasingly aware of this possibility since the Great Recession began, but few want to admit it. Today, America is deeply divided and filled with uncertainty, and a palpable sense of malaise has settled over her people. Could it really be that America’s best days are behind her? We Americans used to be proud of our nation, and certain of who we were as a people. The general feeling that America was a moral and decent country was pervasive throughout the nation, if not much of the world. We proudly flew Old Glory and without reservation proclaimed that the United States of America was the greatest nation on earth. But today that seems to be the exception rather than the rule. Now we have brief, fleeting episodes of pride in our nation around the holidays or when we hear stories of our soldiers and their bravery. But the general feeling of pride in who we are as Americans and what we stand for is fading, and no one seems to know how to get it back. Early in America’s history, Alexander de Tocqueville wrote, “America is great because Americans are good.” If America’s greatness is fading, could it be that something has happened to her people’s goodness? And if America is in permanent decline, will we accept that fate without a fight? In 755 BC, the prophet Hosea was called to deliver a message to another nation in decline, the Northern Kingdom of Israel. 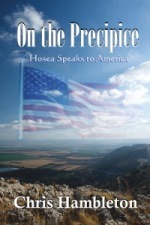 But what would Hosea say if he had been sent to modern-day America instead? And if he had been sent to us instead of Israel, would we be receptive to his message or scorn him as Israel once did? To ask other readers questions about On the Precipice, please sign up. Dreams and visions come to some, to be declared to the masses to be pronounced before it is too late and this book is one of these such as Nostradamus’ warnings; As a reader and a spiritual person In the author’s words: “At this point in American history, we stand on the precipice. Below us lies utter ruin and the jagged rocks of socialism and national collapse, while behind us is the America our forefathers built and loved and died for.